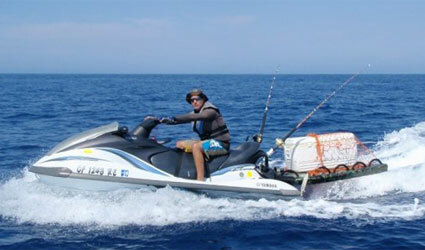 LifeSled has resulted from 23 years of R&D by the industry’s finest watermen operating in extreme conditions worldwide. 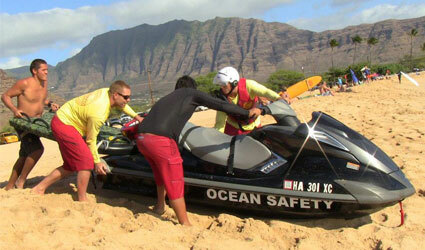 The LifeSled® PWC rescue board was conceived by Hawaiian lifeguards Brian Keaulana and Terry Ahue. It was first designed and manufactured in 1990 by Gary Fisher of Wahoo International Inc., innovators of Solarez®. At that time the board was merely a hefty bodyboard with several handles and a three point hook up for the then popular Yahama WaveRunner III. Since then, this sled has undergone numerous internal design changes to keep it unique amongst other companies’ boards that would follow it. The characteristics of the LifeSled that set it apart from the others are greatly attributed to its composite construction. A true plastic composite is like a metal alloy in that the desirable properties of multiple materials are expressed in the final product. For example, in order to have a lightweight flexible core and soft exterior married to an aluminum tow system, step-down densities of strategically placed transitional plastics need to displace the loads. The overall rigidity of a sled required to carry loads in excess of 450 lbs over the fulcrum of the transom must also have the modulus sufficient to endure sharp blows without fracturing, all the while being comfortable to ride on. 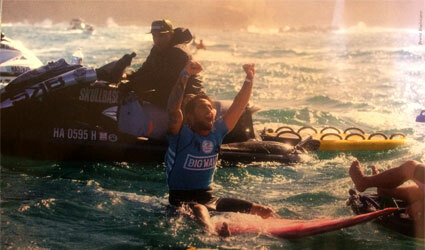 This is accomplished by LifeSled’s intelligent and proprietary stringer system. It’s not only what materials are used, it’s how they are used. 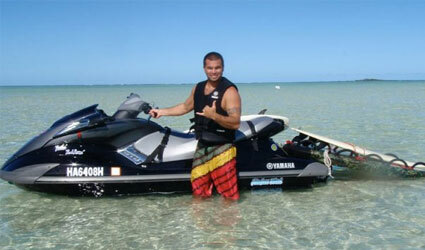 Other original LifeSled features that make this device uniquely functional are our custom transom adaptors made for each personal watercraft make and model. 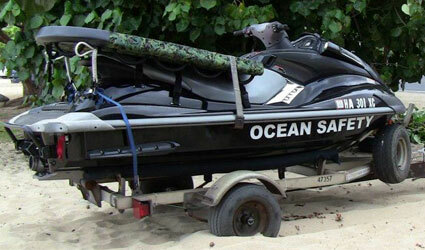 LifeSled’s transom adaptors are vacuum-formed from high-impact ABS to each jet ski’s unique exterior allowing the rescue sled to nicely draft behind boat while underway. From first glance, you’ll see LifeSled’s virgin hull of a weatherable high impact copolymer that has no protruding parts such as handles or anchor points. The deck and rails are tacky when wet and highly abrasion resistant. The ten conspicuous composite handles on the LS1 and twelve on the LS2 are very firm and comfortable to hold even with cold, wet hands. They are simply potted with no extraneous shrouds or screws. 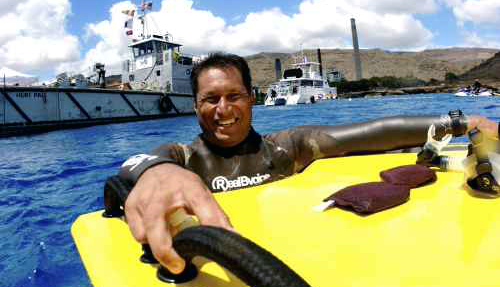 The overall sled template is designed to function well in the draft of the boat and the rails are contoured to track through the water but allow it to break loose for initiating low speed turns. Some companies have produced straight templates with flat rails that have a tendency to dig causing erratic behavior. 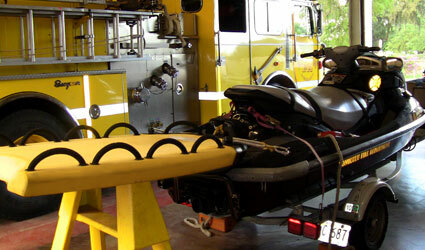 The swallow-tail design of the LifeSled facilitates the centering of bodies as when an incapacitated victim is uphauled. 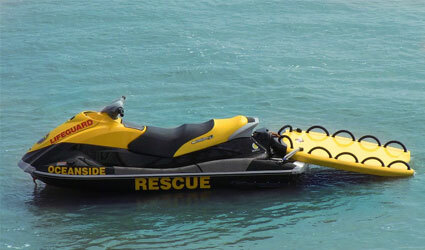 It is fairly obvious to see that jet ski manufacturers are not building PWCs with a water rescue sled in mind despite the fact that PWCs for water safety are useless without a rescue sled. 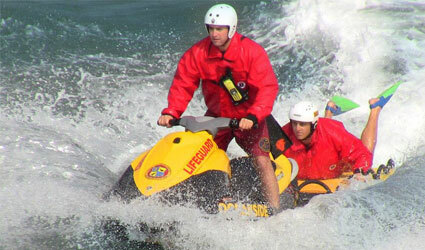 Certainly, you can reach your victim quickly with a jet ski but try to uphaul an incapacitated victim in the 11 seconds before the next big wave comes. We see transoms of all shapes and contours and engine cowlings with oblique angles that are not conducive to the connection of a water rescue board. So, Wahoo International has designed inexpensive mounting adaptors that greatly improve the handling of the PWC/SLED “system”. A stable three point hook-up was invented by Wahoo International and appears to be the most effective system available to date. Our modular lateral stabilizer system is inexpensive, lasts about 3 years or more and simply screws into the robust 1″ NPT fittings.